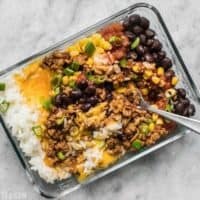 The Easiest Burrito Bowl Meal Prep that you can put together in about 30 minutes with minimal cooking, chopping, and nothing to pack on the side. Lunch can be easy and tasty! Cook the rice first. You will be able to prepare all the rest of the ingredients as the rice cooks. Cook the rice according to the package directions. To yield about 4 cups white rice, I use 1.5 cups uncooked rice and 2.5 cups water, but this may vary depending on your rice variety, so be sure to check the package. While the rice is cooking, add the ground turkey or beef to a skillet and cook over medium heat until it is cooked through. Depending on the fat content of your meat, you may need to add a little oil to the skillet to keep it from sticking. Once the meat is fully cooked, add the taco seasoning and 1/2 cup water. Stir and simmer the meat and spices until the water reduces to a saucy consistency (about 5 minutes). Turn the heat off and set the meat aside. Thaw the corn kernels, rinse and drain the black beans, shred the cheese, and slice the green onions. Once the rice is finished, fluff it with a fork and divide it between four containers. Divide the remaining six bowl ingredients between the containers as well (taco meat, corn, beans, cheese, salsa, and green onions). Reheat the bowls for 1-2 minutes before eating to melt the cheese and heat the meat and rice through. I used my own taco seasoning recipe, with the optional cornstarch to give the meat a slightly saucy consistency. You can use a store-bought envelope of taco seasoning if you prefer.